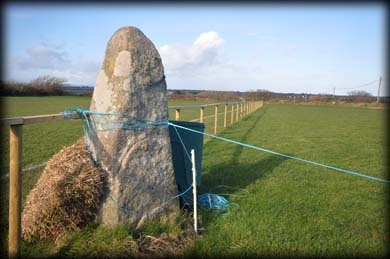 I was looking forward to visiting the standing stone at Loginsherd, County Wexford. 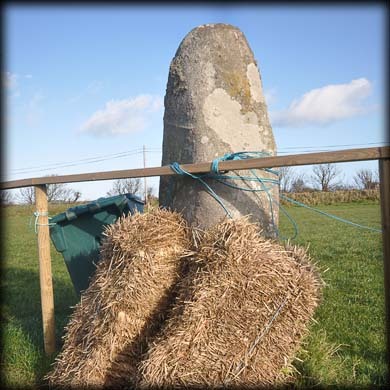 I had seen images showing this very impressive monolith standing in a field near Castletown. Boy was I in for a surprise. The west side of the field hosts a football pitch belonging to Carne FC. The megalith is very close to the east side of the pitch and has straw bales leaning against the stone to protect any players for injury. For some reason that I have not worked out yet, a few ropes have been tied around this once magnificent monument. The granite stone stands 1.93 metres high and is orientated NE-SW, with a rectangular cross-section. I am amazed that this monument was not given more respect, it is sad to see our heritage treated in this manner, I am sure that with a bit of thought, something more favourable to everyone could have worked out. Situated: Head south from Wexford Town on the N11. After Tagoat take a right turn for Carne Beach/Ladys Island. Go to the end of here passed Ladys Island and take a left at the T-Junction. The megalith is down here on your right in the field with Carne Football Club. Discovery Map 77. T 1162 0541. Last visit Jan 2015.